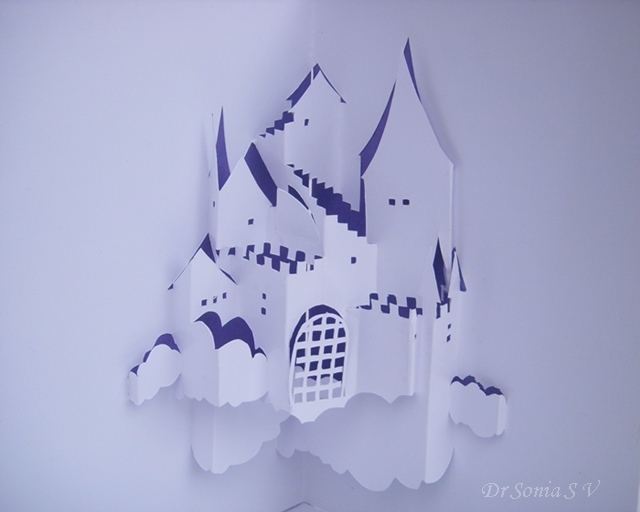 I find Origamic Architecture so fascinating - it is almost magical to find how a single sheet of paper can be transformed into a 3 Dimensional beautiful structure!It is one of my favorite paper crafts. 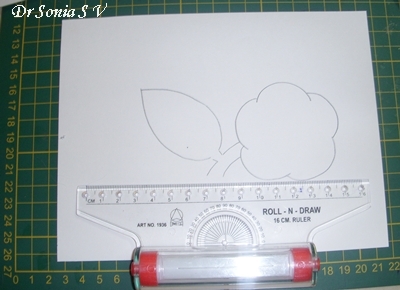 It is cheap [ you just need a craft knife ,sturdy paper and good hands! 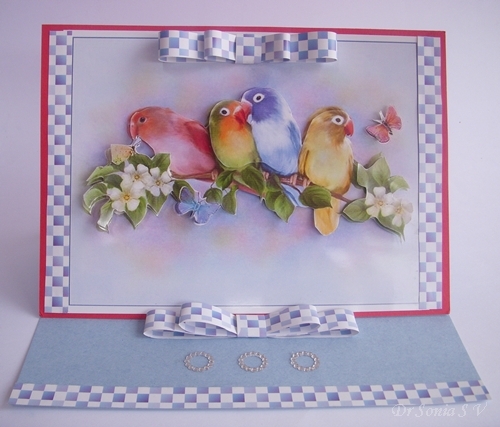 ], interesting and oh so rewarding! 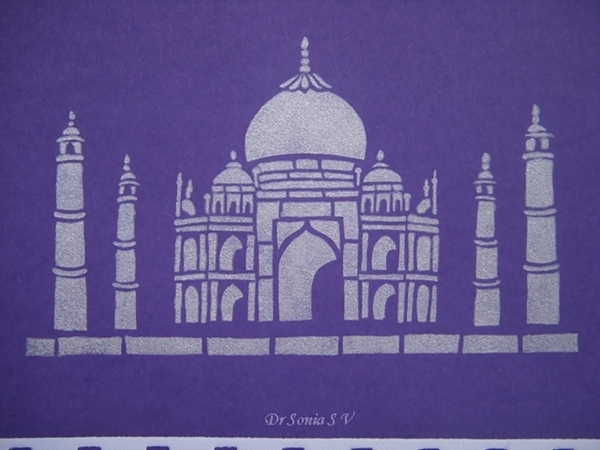 In keeping with my Taj Mahal theme I stamped a Taj Mahal on the front of my card using pearl white acrylic paint and a locally bought stencil. 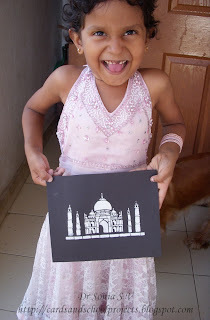 Here is the closeup of the stencil art Taj Mahal.I actually got the Taj Mahal stencil for my little daughter as she has been fascinated with the Taj Mahal ever since we did a school project on it. 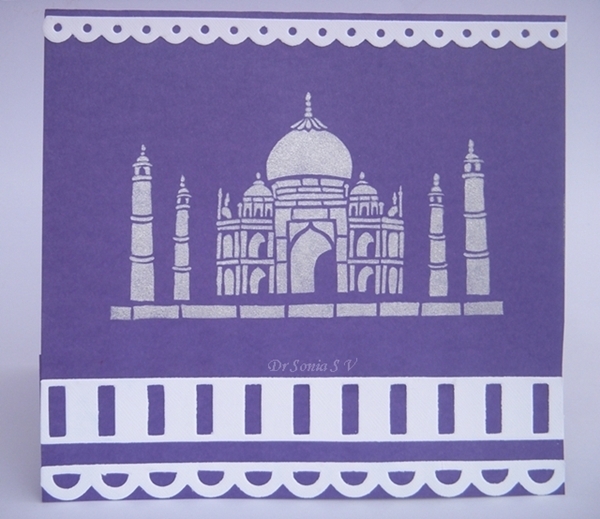 The Taj Mahal is such a fascinating building as its a symbol of love --it is beauty and elegance personified! -The Taj Mahal is a monument of eternal love located in Agra in North India. It was built by the Mugal Emperor Shah Jahan for his beloved wife Mumtaz Mahal who died shortly after giving birth to their 14th Child. The Taj Mahal was built out of marble and precious stones from different parts of India and the world. It took 20000 workers 22 years to complete the exquisite structure. 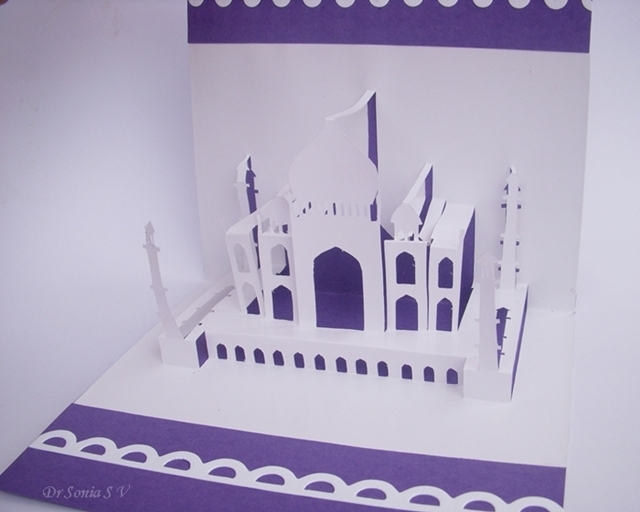 The pop up kirigami Taj Mahal is a pattern I love to make again and again for special occasions and a special someone!Its such a fitting card for an anniversary ,valentines day,a wedding and for the special male in your life [ as I said in an earlier post guys seem to love Origamic architecture!- This is one craft which is guaranteed to get a "wow" from my hubby! ].It looks so good displayed on your showcase too! 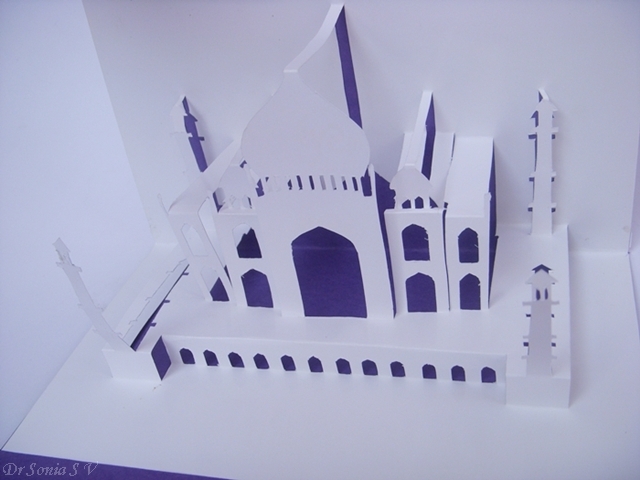 Here are the links to the Taj Mahal Pattern if you want to make it and other Origamic Architecture Patterns which you can practice on to gain confidence. 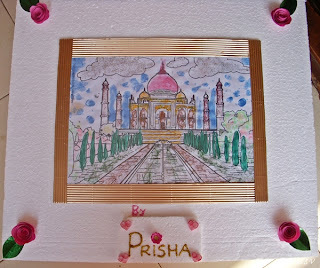 Taj Mahal finger painting and glitter art- Finger painting and "what not "painting of the Taj Mahal by my little one! 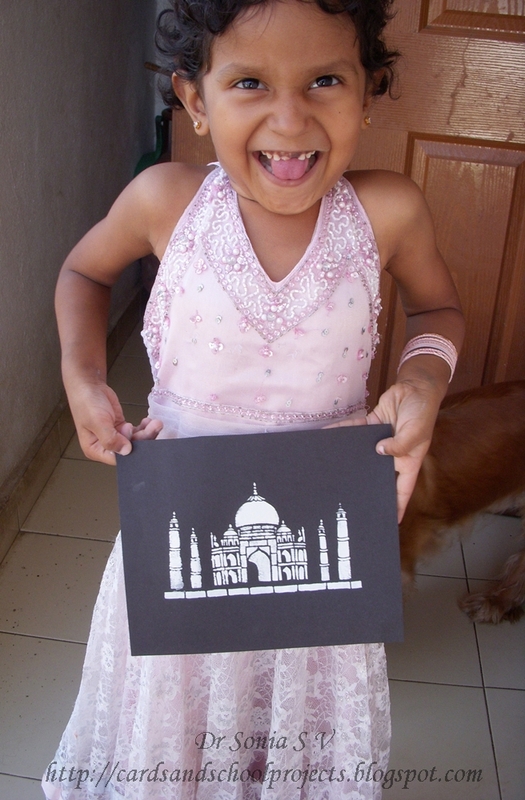 Taj Mahal Stencil Art -My kiddo proud of her stencil art Taj Mahal! 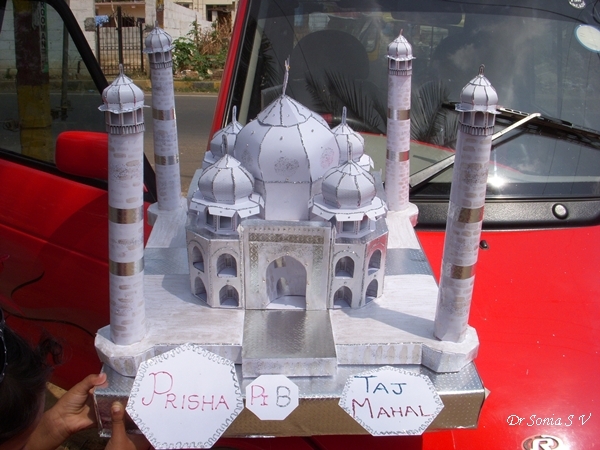 Taj Mahal Paper Model- that's our huge Paper Taj Mahal Model atop my electric Reva car! 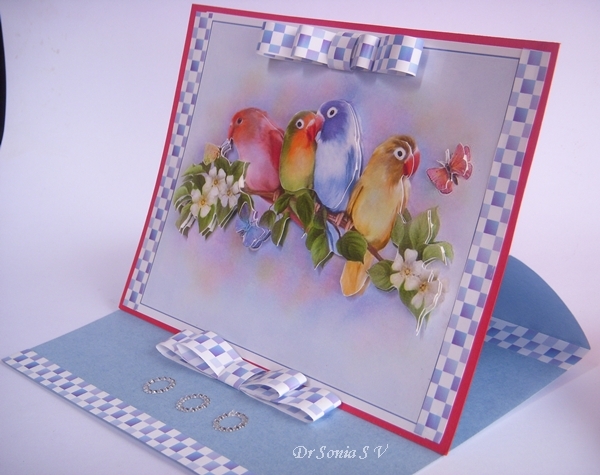 Sharing a 3 D Decoupaged Easel card with recycled paper bows . 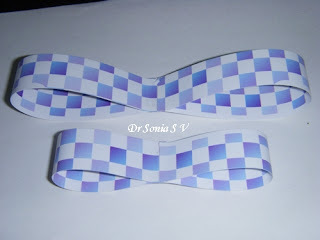 Knowing how to make a paper bow is quite a handy thing as it can help transform your gift wrap into a thing of beauty! With a lot of festivals going on there is a lot of gifting all around. 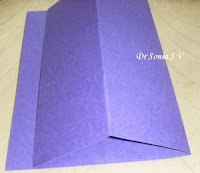 Sharing a super simple tutorial to make quick and easy paper bow. By now I think my blogger pals know how much I love recycling - The moment I see something that should go into the rubbish bin I try to see if there is something pretty I can salvage and I am so glad I salvaged this medication advertisement. Make 2 bows one shorter than the other-- no strict measuring here- its an "as you please" kind of Bow! Place the smaller bow atop the longer one and gently stick at the center .Take a small paper strip and wrap around the center and glue at the back.Your 3 D super easy bow is done! This is the side view showing the pretty bows and borders from my recycling adventure! 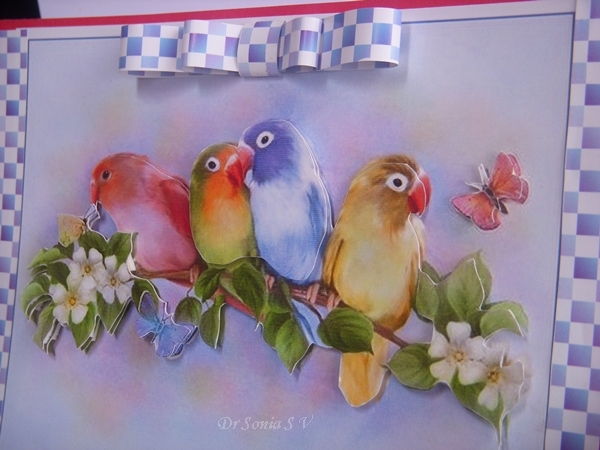 Hope I can inspire you to look around you and salvage some paper to recycle! In our home I have made even my noncrafty hubby collect all sorts of junk which he dutifully tuns over to me saying " you can make something out of it!" 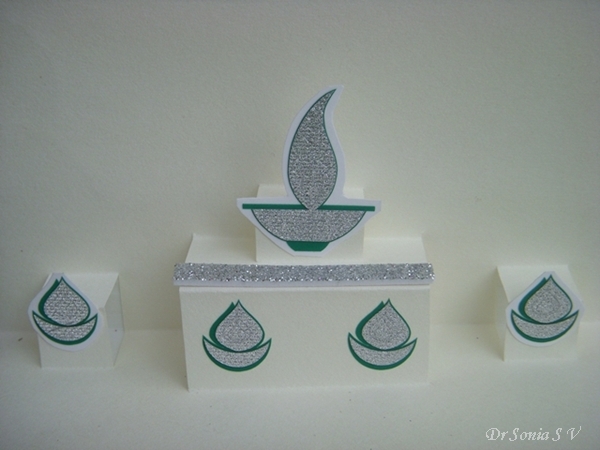 Its Diwali time in India.Diwali is an Indian festival of lights and is celebrated with lamps, lights and crackers.I was too lazy to make any Diwali cards earlier but today my daughter had Diwali celebrations in school and this morning we whipped up 2 super quick Diwali pop up cards. 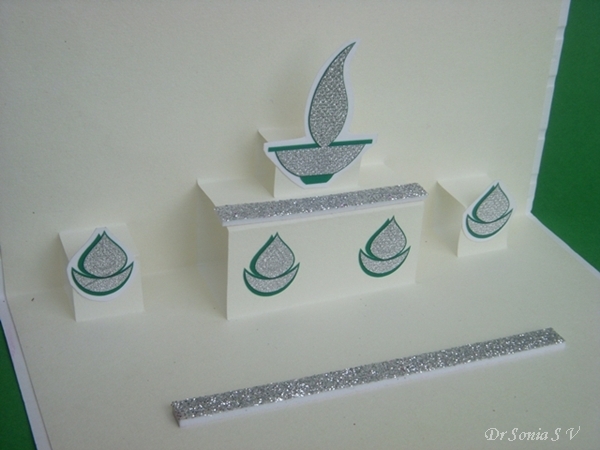 Here is the closeup of the Diwali Pop up card pattern. 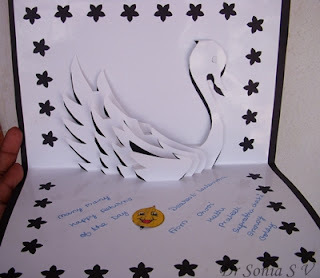 It was pretty easy to make this pop up card- No craft knife involved only scissors and folding! I am always amazed at the generosity of bloggers!Last night my husband came home with a parcel from my blogger pal Jovita who has opened a new craft store and is selling Pie Lane stuff and lots of other goodies. 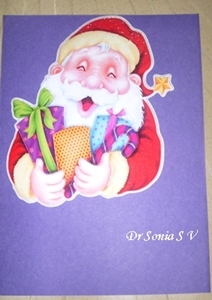 She had sent my daughter some gorgeous Pie Lane Diwali themed stickers and making these cards with those stickers was a breeze-- my daughter really enjoyed herself! Thank You so much Jovi. 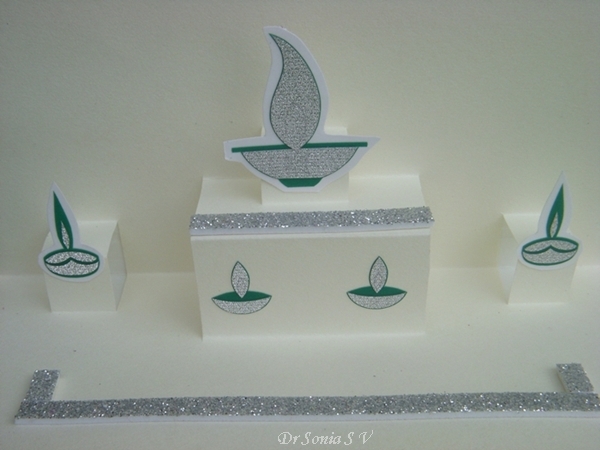 The Diwali themed stickers looked so gorgeous I didnt want to clutter the pop up card with any other elements. 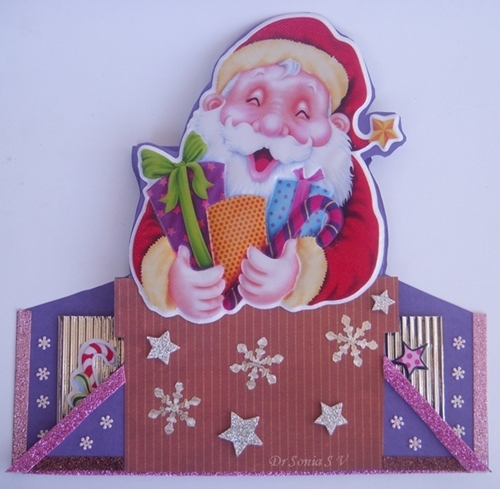 Here is the template to the pop up card pattern used in this card.Cut on the bold lines .Valley fold the dotted lines and mountain fold the slashed lines. 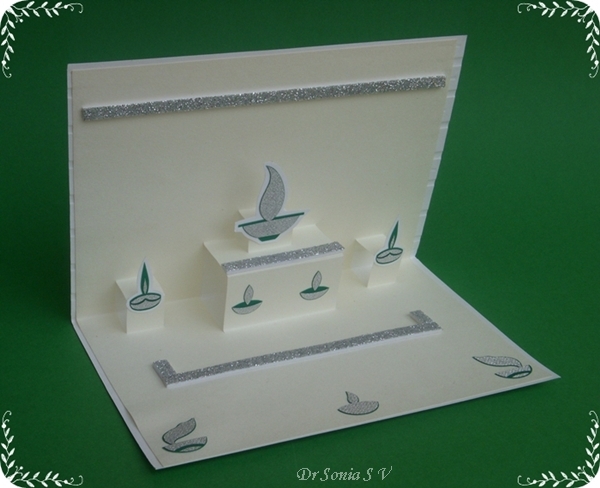 Wishing my Indian Blogger pals a Happy Diwali. Do leave me your thoughts on this simple creation. I love Kirigami pop up cards .Once you get the knack of it they are not too hard to make but you gotta love your knife in this craft!! For those unfamiliar with the term, Origamic Architecture means a 3 Dimensional reconstruction of buildings or objects by cutting and folding paper.Masaharo Chatani a Japanese architect is considered the father of this craft which came into vogue only in the 1980s. 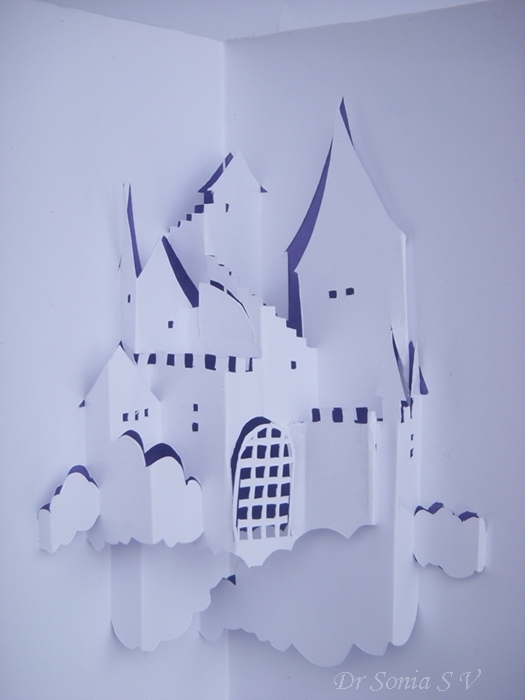 This Kirigami pop up castle card is scored, folded and handcut from a single sheet of 180g photo paper. 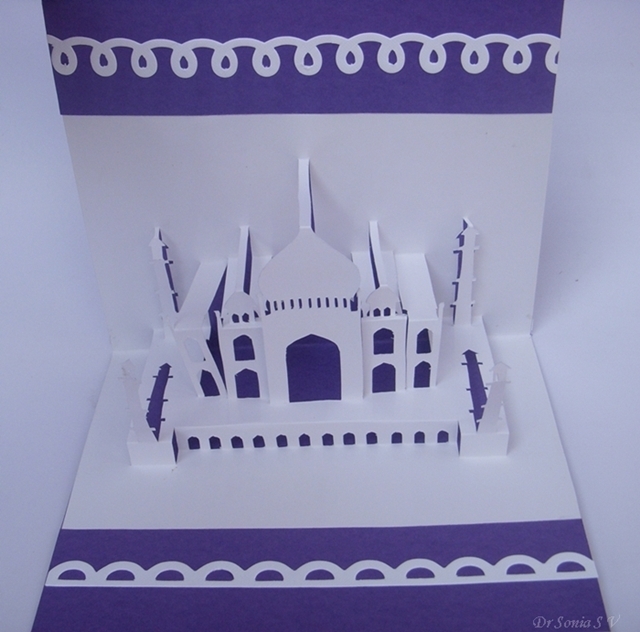 The cutting takes around 15 mins if you are at it at a stretch.I usually do my Kirigami pop up cards in bits and pieces as they need a bit of concentration! The scoring and folding was more time consuming as my pattern didn't have guidelines as to which was mountain or valley fold and I had to experiment a bit. Somehow I find men are more fascinated with Origamic Architecture-My husband seems to love them! If you have never tried this craft do try it you just need a craft knife , your kitchen cutting board and sturdy paper! Just to get your interest piqued,here are some of my older Origamic architecture Kirigami Pop up cards some imperfect ,some ok ,and some like the puppy which I just love! These are different from the usual pop up cards as these involve cutting and folding of a single sheet of paper! I hope I got your interested in this fantastic craft.Here is a link to Marivi who shares some gorgeous free patterns to try. Score always before folding- this gives a crisp neat effect. 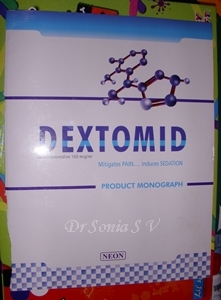 Use sturdy paper such as photo paper 180 g -220 g works well for me. 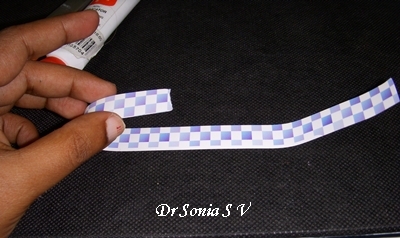 Use a sharp craft knife [ xacto knife] - even a little blunting can jag your edges! For fast cutting first cut all the lines that run in one direction[vertically or horizontally]- that way you work fairly fast. I you are not sure about the accuracy of your folding in a mutlifold origamic architecture pattern- dont score the central crease- score and fold the other creases and fold over the card and let the central crease occur naturally- this is a little trick I picked up after some frustrated" not folding well" pop up cards! 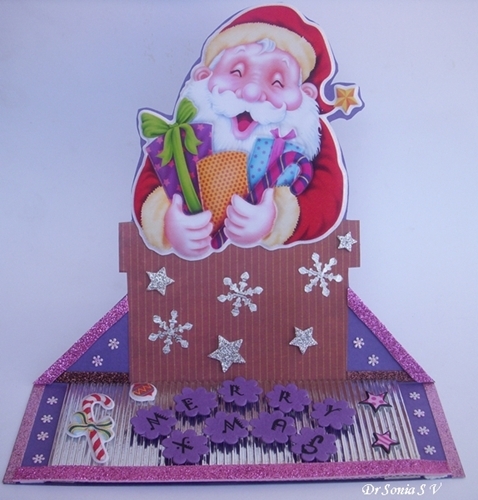 I am very much in love with Easel cards and experimented with the mechanics of this type of card to make a shaped card.I made a Santa in a chimney card using a Santa Claus sticker.I shaped the parts of the Easel Card to give it a House Shape with a large Chimney and Santa popping out! 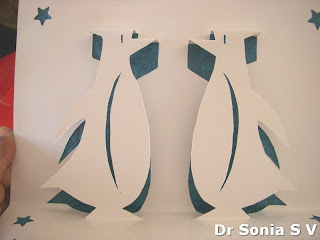 Sharing a simple tutorial to make a shaped Easel Card.You can make any shaped Easel using these instructions. I stuck my Santa on card stock . I added a Chimney shape for my Santa to pop out of and cut out the Santa and the Chimney. 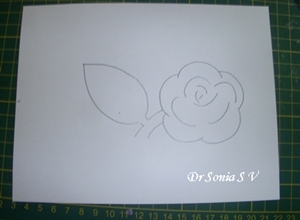 Place your Shape on the front half of your Easel Card and trace out the shape. 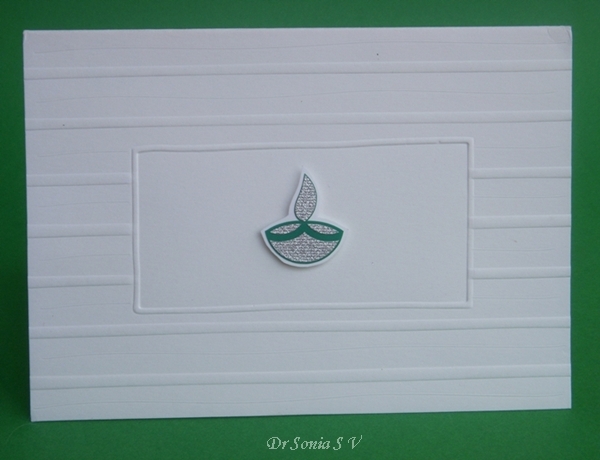 You can cut out the shape exactly on the front part of your card or tweak it more like I did here.I cut the lower half in the shape of a house roof. 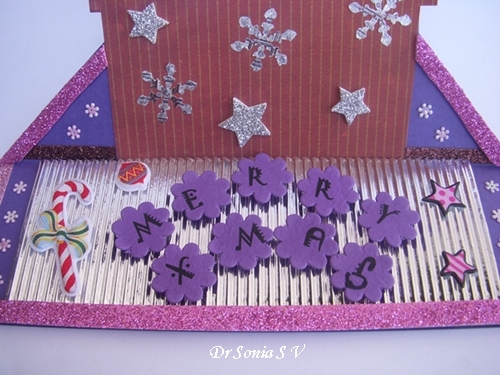 And the back of the Easel Card in a matching house shape. 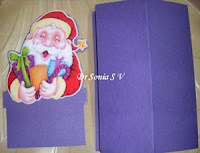 Stick your Shape to the lower half of the front panel and your Shaped Easel Card is done!Here is how the Santa Easel looks folded flat for mailing. 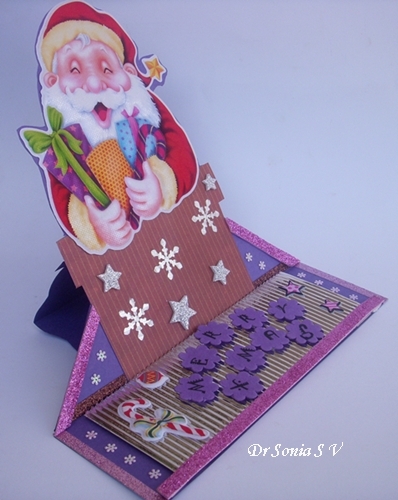 And here is the Propped up Easel card shaped like a house with a chimney and Santa popping out to wish you! 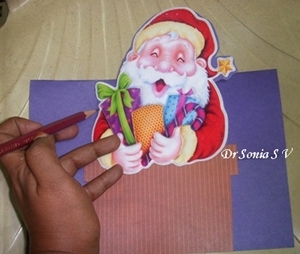 I have kept the embellishments fairly simple as I wanted Santa to be the prominent feature. 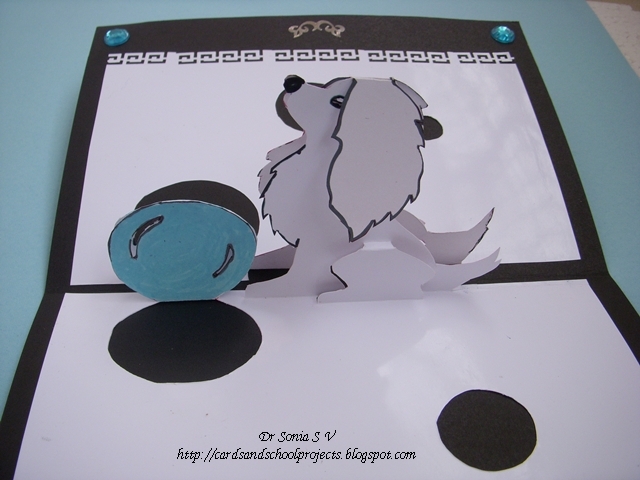 I hope you will find these instructions useful to adapt to your own Shaped Easel Card. Do tell me how you find it. 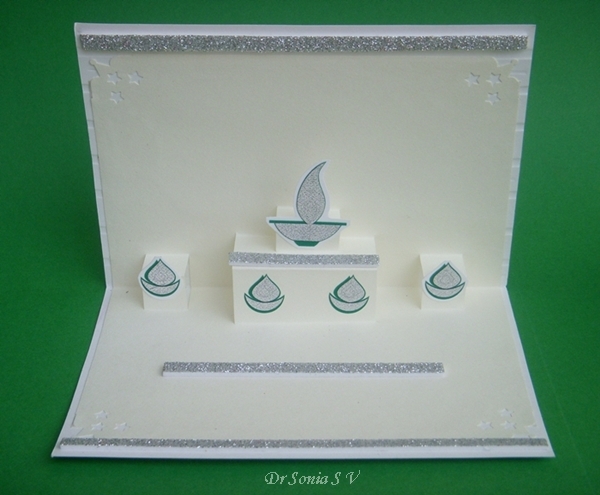 This Easel Card with a Kirigami Pop up combines embossing, stamping and a self designed Kirigami pop up pattern! 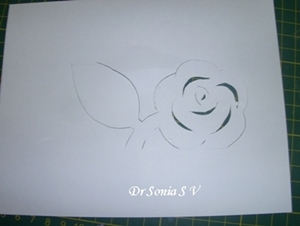 I hand embossed the roses using a gorgeous embossing plate Lisa Jane of MIM sent me as part of a giveaway win. 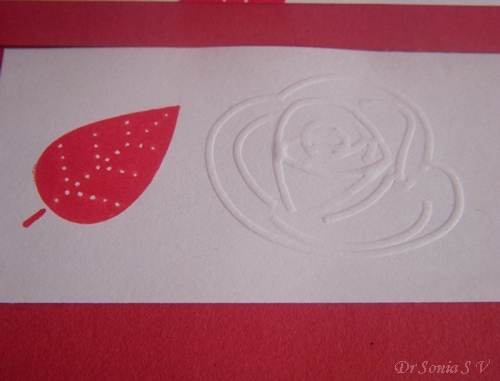 I used a wooden leaf stamp also sent from the UK by Lisa Jane[from MIM]to add red leaves. 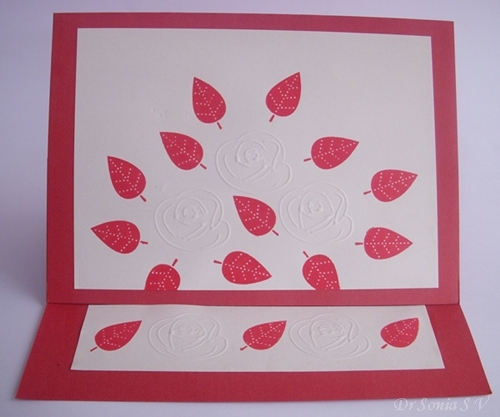 So far I have made Kirigami cards using designs from books or the net - today I wanted my design to match the rose- leaf pattern so designed my own pattern-- It was fun and not as difficult as I thought. I made the Kirigami Pop up pattern look "CAS" [Clean and Simple] and not too complicated! What do your say? 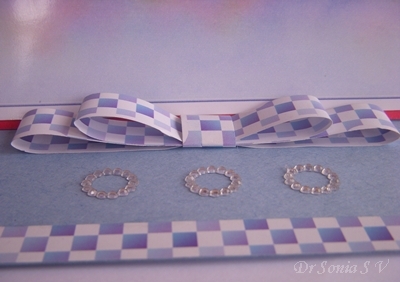 This is not the best of my tutorials as the light was atrocious while I made it and so didnt snap many pictures.If you need clarifications do let me know and I shall post clearer instructions in another Kirigami card tutorial. For this pattern I just used a cream sheet from my daughters drawing book as my pattern is not elaborate and does not have much cutting involved. If your pattern has lots of cuts you need to use a card stock.I dont like to use very thick card stock as it doesnt fold very well. 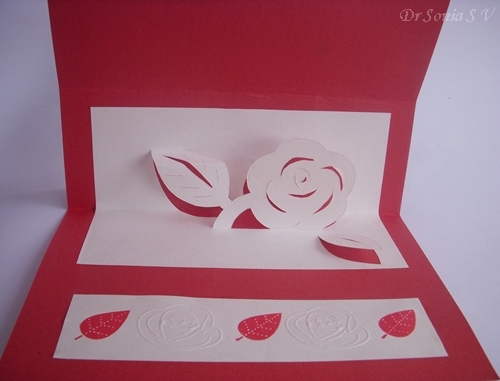 White Glue: For kirigami pop up cards,the trick is to use a glue which is strong and fast drying. 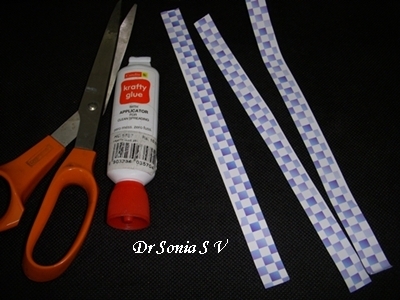 Use the minimal amount of glue but be sure to apply it evenly till the edges of your design. Craft Knife: A sharp craft knife is essential- I don't recommend any brand- even cheap brands would do as long as the blade is new and sharp. Cutting Surface: Use your Kitchen cutting board or a cutting mat if you have one. Kirigami Pattern: There are many free patterns on the net if you Google it but today I will share how you can design a simple pattern yourself. 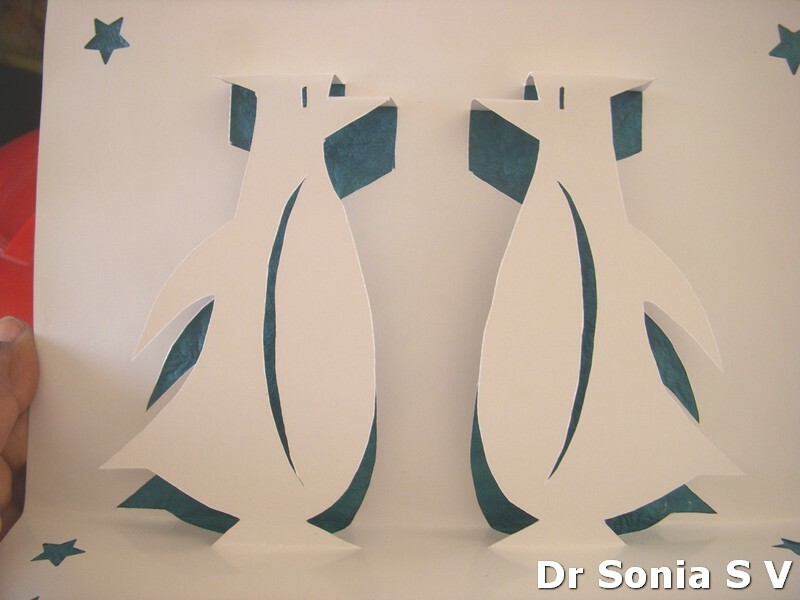 Cut out areas as I have done her- dont cut out more as then you will compromise on the support of your pop up and your Kirigami Pop up may buckle. Plan your creases.Now comes the maths! 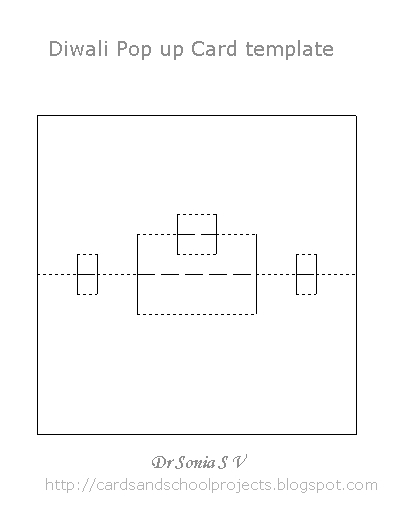 I am not a maths enthusiast [ that's why I became a doctor!!] 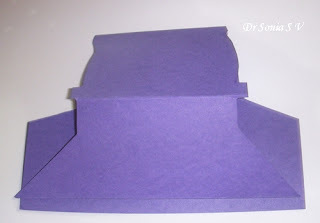 but you need a bit of "paper engineering calculation" to get a pop up card right! The blue line will be the central crease [which lies on your card's central gully].Note that it does not run through the image. The red lines- are valley folds and are the places where your popup is anchored to your base. The green line- is a mountain fold. 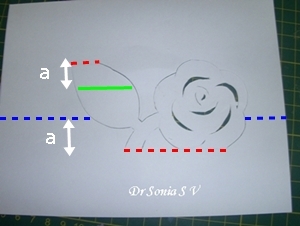 And its position is such that distances a= a. 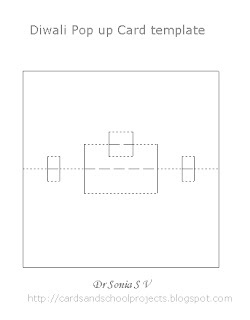 Cut your Kirigami pop up pattern image all around except at the anchoring points shown by the dotted red lines. Score creases at red and blue lines. Your Kirigami pop up pattern is ready.Apply glue till the edges and stick on a backing card of contrasting colors.